In response to an overwhelming outpouring of support from Hawaiians for the protection of sharks in 2010, the state legislature passed a bill to make Hawaii the first jurisdiction in the country to ban the trade in shark fins. But now, a proposed rule by the federal government could wipe out these critical protections! The National Oceanic and Atmospheric Administration (NOAA) believes our state law prohibiting the trade in shark fins conflicts with federal fishing rules and wants to preempt Hawaii's protections. Hawaii paved the way for California, Washington, Oregon, Illinois, Delaware, Maryland, New York, Guam, Northern Mariana Islands, and American Samoa to follow our lead and pass similar legislation to protect sharks. Now the time has come for Hawaii to lead again to ensure that these vital conservation laws are preserved. The global demand for shark fins and other shark products has put these species on the path to extinction. Approximately 100 million sharks are killed each year, and as a result more than half of all species of sharks and shark-like species are threatened or near threatened with extinction. Sharks grow slowly, reach sexual maturity relatively late in life, and only produce a few offspring at a time, so they can't quickly replenish their populations when they are overfished. Sign our petition in support of Hawaii's shark protections to send a message to President Obama and Governor Abercrombie urging them to protect our law. According to a release from The Pew Charitable Trusts, all four of the Federated States of Micronesia (FSM) have enacted shark protections now that the state of Chuuk has passed legislation that bans shark fishing in its waters. Governor Johnson Elimo signed the measure on May 1, 2014, and a celebratory ceremony was held on May 8, 2014 in the state capital, Weno. Want to know more about the sharks of Micronesia? This video produced by Pew describes the three year effort to protect sharks throughout the entire region, which includes Guam, FSM, Marshall Islands, Northern Mariana Islands, and Palau, and create the Micronesia Regional Shark Sanctuary, an area of protected shark habitat nearly as large as the European Union. The Chuuk Conservation Society and the Micronesia Conservation Trust championed the new shark sanctuary and worked with community leaders and stakeholders to ensure its creation. Now that the sanctuary is in place, these organizations will work with Pew to conduct enforcement training and continued outreach and education. The film Sanctuary: The Last Stand for Sharks is an educational tool being used across the Micronesia region to help people understand the threats sharks face and how shark sanctuaries can protect them. Last week we told you about the students in Guam who have taken a stand to protect sharks on their island…again. Guam passed their shark protection law in 2011 and it has been working well since then. But now a federal U.S. agency—the National Oceanic and Atmospheric Administration (NOAA)—claims that Guam’s law conflicts with federal fishing rules and is therefore preempted by federal law. In other words, if the federal government gets its way, the protections that we enacted for sharks on Guam could be completely nullified. With half of all shark species threatened or near-threatened with extinction, no one wants to see that happen, especially the students who fought so hard to get these protections three years ago. Fortunately, this generation understands that the future of our oceans depends on healthy populations of sharks, and apathy is not an option. 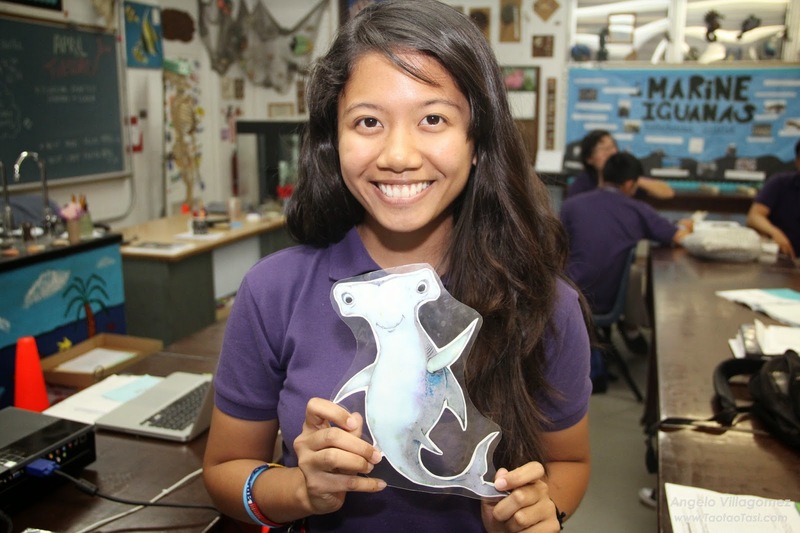 Guam students quickly jumped into action and started an online petition to show NOAA officials in Washington, DC and President Barack Obama that Guam wants to keep its shark protections and the federal government should stop meddling in local conservation efforts. Use social media to get the attention of elected officials: Tweet at Guam Governor, Eddie Calvo (@governorcalvo), and post on U.S. Representative Madeline Bordallo’s Facebook page and ask them to stand up for Guam and our sharks by making sure that NOAA doesn’t wipe out our local shark protections. Let NOAA know you want to preserve shark protections: Write to decision makers at NOAA and politely ask them to preserve our local conservation laws. You can email Dr. Kathryn Sullivan, Under Secretary of Commerce for Oceans and Atmosphere and NOAA Administrator. Write an email to local and national elected officials: Contact Guam Governor, Eddie Calvo, CNMI Governor Eloy Inos, and U.S. Congresswoman Madeleine Bordallo and ask them to fight to preserve our local shark protections. Write a letter to the editor. Write a short (250 words or fewer) letter to your local newspaper to help spread the word about the threat to shark protection laws. If you need help with talking points, check out this blog.